Definitely not a primer about "How to deal with a scheming chief of police", but cherished by music lovers around the world as one of Puccini's most lyrical scores. Set in 1800 in Rome, this dramatic story has it all - love, jealousy, intrigue, deception, and a murder or two just to keep anyone from sneaking off to the concession area early. Working to a recording featuring Maestro Victor de Sabata with Maria Callas, Tito Gobbi, Giuseppe DiStefano and Franco Calabrese, the New England Marionette Opera extracts everything this renowned recording has to offer and leaves the audience begging for more. The 1953 recording captures Callas at the pinnacle of her career, singing the role which launched and concluded her operatic odyssey. 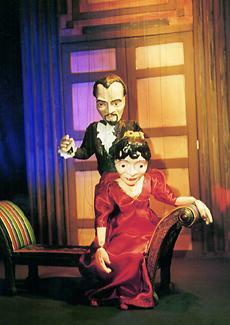 The New England Marionette Opera began work on this production in July, 1995. Hundreds of hours were poured into research of the piece and the period. Breaking with operatic tradition, the Marionette version sets the first act in the Church of Sant' Andrea al Quirinale as proclaimed in the original play by Sardou. Elaborate sets, two dozen marionettes, and extensive use of TransTitles®, promise to make this production one of the most lavish in the theatre's history.